Are you looking for something worthwhile to do with your time? Want a flexible work schedule? 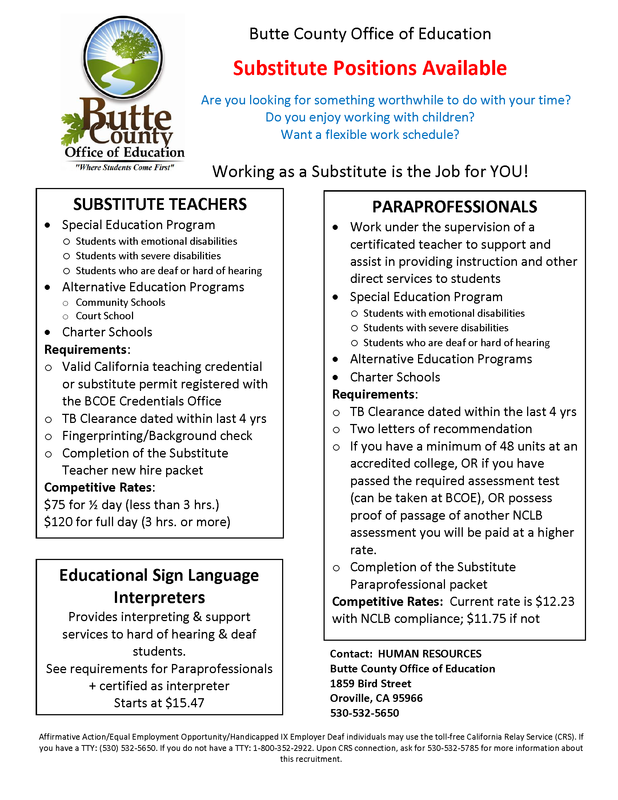 Working as a Substitute is the Job for YOU! If you have a minimum of 48 units at an accredited college, OR if you have passed the required assessment test (can be taken at BCOE), OR possess proof of passage of another NCLB assessment you will be paid at a higher rate. Affirmative Action/Equal Employment Opportunity/Handicapped IX Employer Deaf individuals may use the toll-free California Relay Service (CRS). If you have a TTY: (530) 532-5650. If you do not have a TTY: 1-800-352-2922. Upon CRS connection, ask for 530-532-5785 for more information about this recruitment.